Telescopic banner stands, also known as adjustable banner stands, have an infinitely adjustable height, and in some cases width, thanks to telescoping poles that make up the banner stand structure. This makes them very versatile banner stands because they can be used as a full-size display, as a table top display, or at any size in between. 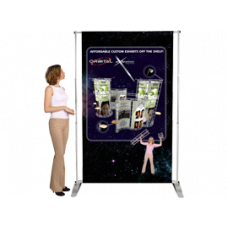 This versatility means they can be used virtually any where... at trade shows, exhibits, sales presentations, meetings, offices, and more. Our telescopic banner stand graphics are printed at 720 dpi resolution onto a premium, super-smooth vinyl that is very durable and has virtually no edge curl. Fabric banners are available upon request, but we highly recommend our super-smooth vinyl as the print medium for adjustable banner stands. 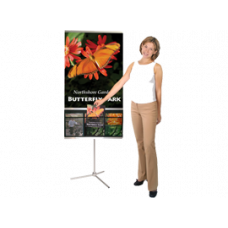 The Dash is an inexpensive and easy-to-use telescopic banner stand manufactured from anodized alumin.. The Pegasus adjustable banner stand offers the ultimate in versatility with dual telescoping poles (.. The Uno telescopic banner stand is recognized as the market leader because of it's versatility and e..